A-Access Lock & Key is synonymous with fast and reliable service. We can help you when it comes to issues requiring a commercial and dependable locksmith in Charlotte, NC, and neighboring areas. We can even offer you more. 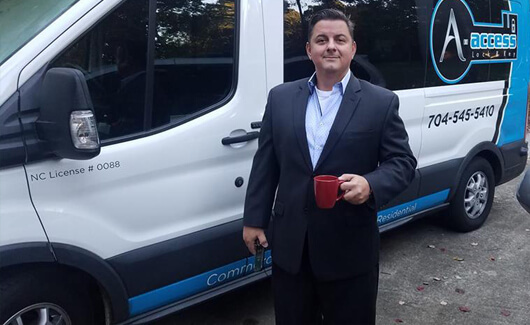 The moment you call us (704-545-5410) and see our service van coming to the rescue, expect professional service, from our prompt and polite technicians to their fast and result-driven locksmith services. All our technicians are trained, licensed, and experienced in dealing with a wide variety of locks in offices, enterprises, and other business establishments. That’s the least you can expect from a company that has undergone a thorough background check and is offering bonded and insured dependable locksmith services. Regardless of the type of lock you’re using in your office, we can figure it out. This is the biggest benefit of hiring the services of technicians who have been in the business for more than 20 years and who have kept up with the fast-changing technology used in locks. Aside from unlocking commercial establishments, our Charlotte commercial locksmith services also include providing panic bars, commercial door locks, and high security locks to enhance the security of your office or even the entire building. Our technicians are skilled in installing modern locking systems, such as CX-5 or Scorpion and Mul-T Lock. "Teddy came out today to help us [Pita Pit of Indian Trail] with our mailbox, and we could not be happier with the service we received! A-Access Locksmith was the only company who answered their phone, and their service was prompt, honest in the estimate, and getting into our mailbox/having a new lock and set of keys made took no time at all! Teddy was friendly and easy to work with (he definitely deserved a free lunch, which we were happy to provide!). Hopefully, we'll never need locksmith services again, but if we do, we'll know who to call- you can't go wrong with these guys!" If you want commercial door locks or panic bars installed, we are the men for the job. These advanced locking systems boast of features that are high drill resistant and pick resistant. The Mul-T Lock system, for instance, comes with a lifetime guarantee, provided that it is installed properly, and we can do that for you. You would not want to waste the opportunity to have a guaranteed locking system for life by skimping on the installation fees and hiring amateurs to do it. Our experienced technicians can do it with ease, while assuring that the manufacturer will not find anything wrong with the installation of the Mul-T Lock. You will have the best hardware installed in the most secure way possible if you choose us. If you want to make sure that your commercial locksmith services can be trusted, then choose A-Access Lock & Key. Our licensed, insured, and bonded locksmith in Charlotte, NC will take care of your needs, whether it is unlocking your office or enhancing its locks for a better security. The most common issues of the loss of keys and getting locked out often take place but if your business is your priority then you would need to conduct regular maintenance of your security system to avoid any mishaps that could occur which could obstruct regular business activities. Safety and security are the two factors you should pay attention to. Although the discussion of burglar and theft could take this on a negative note these issues should be given a second thought and caution should be taken. Don’t gamble the security of your office or commercial establishment by hiring cheap but fly-by-night technicians when you know that you can trust A-Access Lock & Key. We provide our mobile commercial locksmith services from Monday to Saturday, 9 AM to 5 PM. We are a recipient of the 2013 Super Service Award from Angie’s List, certified by ALOA Security Professionals Association, Inc., and accredited by the local Better Business Bureau. 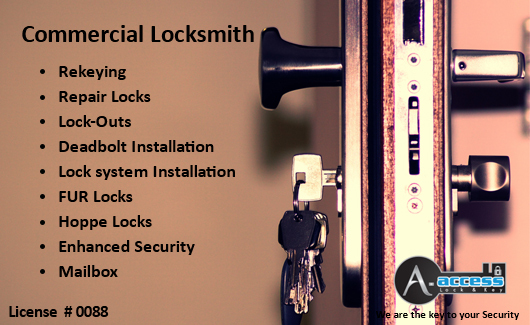 Every penny that you’ll pay for our commercial locksmith services will be worth it. Call us!